Spicy Butternut Squash Soup with Black Beans, Red Bell Pepper, and Cilantro is a great meatless meal that’s gluten-free, low-glycemic, and South Beach Diet phase two. And if you skip the optional sour cream this recipe is vegan. Use the Diet-Type Index to find more recipes like this one. Click to PIN Spicy Vegetarian Butternut Squash Soup! I’m a well-documented fan of butternut squash, so you it’s surprising I haven’t made more soups using my favorite winter squash. It’s partly because I love savory squash dishes, but I don’t really understand the appeal of those sweet butternut squash soups that many people like. No surprise then that this Butternut Squash Soup with Black Beans, Red Bell Pepper, and Cilantro is savory and slightly spicy from the Green Tabasco Sauce that’s stirred in at the end. I ate my soup with a generous dollop of low-fat sour cream, but if you skip the sour cream this meatless soup is vegan. I think this soup would make a lovely Meatless Monday dinner, and if you’re cooking for a family I might sprinkle some crushed tortilla chips into the soup for the kids. You can find more meatless recipes by using Meatless Recipes in the recipe index. Butternut squash can be a challenge to peel and cut up, but for this soup you just cut the squash in half, scrape out seeds, and roast the squash until it’s tender enough to scrape away from the skin. Here’s how the squash looked after I had roasted it about an hour. Let squash cool until you can scoop it out of the skin. Heat the olive oil and saute the onion and celery until soft, about 7 minutes; then add the minced garlic and saute 2-3 minutes more. Add two cups of the vegetable stock to the onion-celery mixture and simmer for 10 minutes. When the squash is cool, scrape the flesh away from the skin and mix it with the other 4 cups of broth and the ground cumin. (This is a giant 8-cup measuring cup.) Add that mixture to the soup pot and simmer about 20 minutes more, then use an Immersion blender or food processor to puree the soup. (Blogger error; I forgot to take a photo of the soup being pureed, but I used my immersion blender.) While the mixture simmers, rinse the black beans with cold water and let them drain. Also chop the cilantro and red bell pepper. Add the beans, red bell pepper, and cilantro to the pureed soup mixture and simmer about 15-20 minutes more. Stir in desired amount of Green Tabasco Sauce and serve hot, with a dollop of low-fat sour cream or plain yogurt if desired. Spicy Butternut Squash Soup with Black Beans, Red Bell Pepper, and Cilantro is a great meatless meal. Using a large chef’s knife, cut butternut squash in half and use a sharp spoon to scoop out seeds. Place squash on a baking sheet and season with salt and fresh ground black pepper. Roast squash until it is soft enough to pierce easily with a fork, and starting to slightly brown, about 50-60 minutes. Let squash cool enough to handle. Heat olive oil in large non-stick soup pot and saute onions and celery until they’re soft, about 7 minutes. Add minced garlic and cook 2-3 minutes more. Add 2 cups of vegetable broth and simmer the mixture about 10 minutes. As soon as the squash has cooled enough to handle, scrape the flesh away with the skin and mix it with the other 4 cups of broth and the ground cumin. While the soup simmers, rinse the black beans well with cold water and let them drain in a colander. Chop the cilantro and red bell pepper. After you’re pureed the soup add the beans, red bell pepper, and cilantro and simmer about 15-20 minutes more, adding a little more vegetable stock if you’d like a thinner soup. Stir in the Green Tabasco Sauce to taste and serve hot, garnished with low-fat sour cream or plain Greek yogurt if desired and tortilla chips if desired. This recipe adapted from Azteca Squash Soup in Bon Appetit. Spicy Vegetarian Butternut Squash Soup is a healthy low-glycemic soup for the South Beach Diet, but the use of butternut squash makes it limited to phase 2 or 3, and of course do not serve with tortilla chips for South Beach. It’s a low-glycemic soup, but probably too high in carbs for most low-carb eating plans. I make this one all the time! i usually kick it up a notch with a tsp of ancho chile powder…. So glad you are enjoying it! I like the sound of adding Ancho Chile Powder! Absolutely delicious!! A huge hit with my entire family, even my husband, who claims he doesn’t like squash! Perfectly seasoned and very well-balanced. This is a dish I will make often. Yum! I just made this. I, too, dislike sweet butternut squash soups. I blended it in the Vitamix because I love the velvety texture it gives soups. I just let it cool a little before putting it in there. I also really like having the beans and peppers in the pureed soup for some texture. I added 1 TB. of the green Tabasco and it was not spicy at all, just a nice flavor. Thank you for the recipe! So glad you enjoyed it Meg. I wish I had a Vitamix! Loved it. Awesome recipe. I just made it for dinner and its already over. My house smells divine due to cumin. I reduced the recipe for just 4 servings since it was my first time but looking the clean bowls, this is a keeper and I will make it again. What do you think about other squash varieties being used in this soup? I think most types of winter squash will work. Thanks Lisa, you are so sweet. Glad you you enjoyed it! Oh my GOSH! This is goooood! I threw in extra beans and lots of toasted cumin and cilantro! few crushed tortillas and teeny bit of grated cheddar on top! half way done with this… just a few more minutes of simmering! I like to toast and grind my cumin seeds. You should smell my kitchen! Thank you Kaylin! YOu are truly my "go to"blogger! This was delicious. I froze several portions for work lunches. Thanks for the recipe. Marie, winter squash like butternut, acorn, etc. are limited to phase 2 or 3. Glad you're enjoying the recipes. Hi Kalyn – this sounds great, I'm hoping to make it today. I don't understand why this isn't a Phase 1 recipe? Probably, but I wouldn't know exactly how to adapt it and I'm not sure it would be an improvement. One thing that makes this good is adding things at different times so the squash is completely done when it's pureed and then the other ingredients keep their shape in the soup. Can this be converted to a slow cooker recipe? Renee, your version sounds great. Thanks for letting us know that it works with canned squash. Made this for dinner tonight it was wonderful. I didn't have any butternut squash or cilantro on hand so I used canned pumpkin and added kale and spinach. Will definitely be making this again. I can't wait to try this, it looks fantastic. My youngest son is now vegan–this should make a great family meal. We LOVE LOVE LOVE the green tabasco sauce…I bought it on the website for him in a 1 gallon jug as a Christmas present!!! Colleen, so glad to hear you enjoyed it! I'm more of a savory soup gal too (and spicy). This sounds like such a warming, comforting soup, could use a bowl right now. Made this for our meatless Monday dinner. My husband loved it. I wouldn't change a thing. It is nice to find a non cream based butternut squash soup. Doren, thanks. Glad you like it! Can't wait to try this. Once again, you bring together so many flavors/ingredients that I love – it's a sure bet! CJ, good idea. It would really be easy with the pre-cut squash. Totally going to be making this one! If you're looking to save time on this recipe, many stores now sell diced butternut squash either fresh or frozen. Thanks Maria; I loved it! Joanne, me too. Sweet squash does not do it for me! Lydia, my pleasure. I bet you would like this with thinly sliced green onions replacing the cilantro. Thanks Jamie, I did love the black beans and red peppers in this. Mmmm Kalyn what a wonderful recipe! 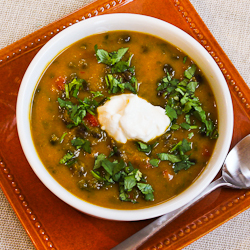 I love cilantro and what a perfect herb for this soup. Love squash soups but think the black beans must add so much great texture. Fabulous recipe! I'm a huge fan of savory and spicy butternut squash soups, too, and I love the addition of black beans that gives it an "almost Three Sisters" flavor. Thanks so much for linking to one of mine. I'm with you on the sweet butternut squash soups…so weird! I'd much rather have this spicy version!